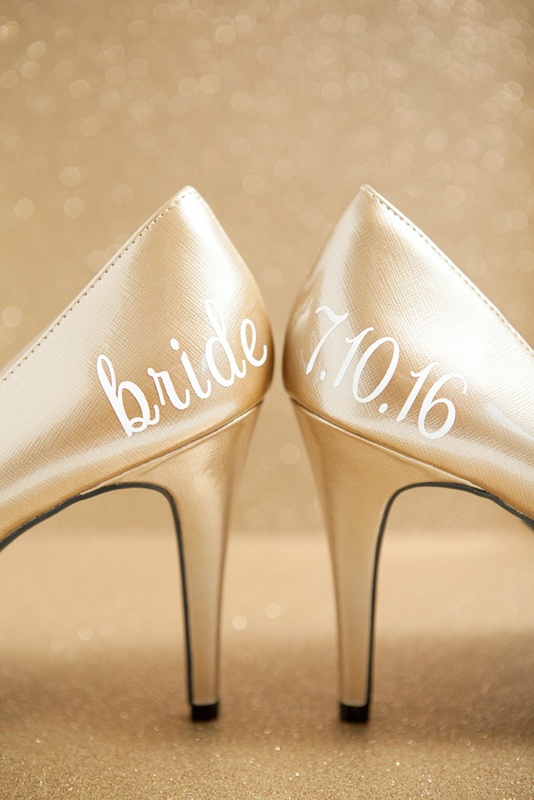 Learn how to make your own custom, wedding shoe stickers! I’m in love with little details… and like the saying goes, it’s the little things that count. This project might be little but it will make for some hugely adorable photos! 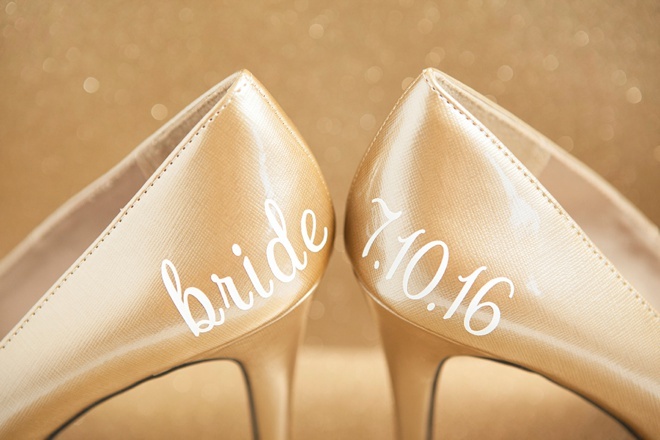 Today I’m sharing how to easily create, totally custom Wedding Shoe Stickers using the Cricut Explore. 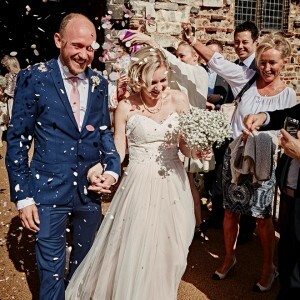 Your “sticker” options are endless so get ready to be creative, make them fit your event and say something special. 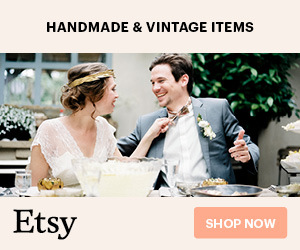 You might even want to make them for your bridesmaids + groom! Have you heard? 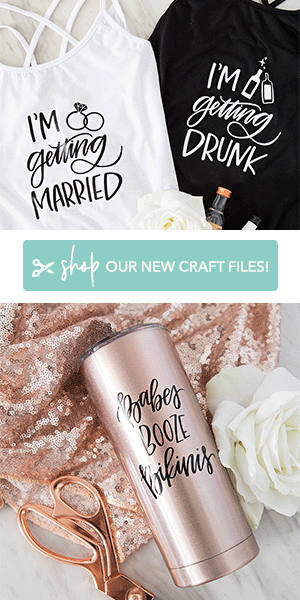 Cricut is releasing a GOLD Special Edition Explore Air…OMG! As if you didn’t love this machine enough already, they had to go and make a gold one! 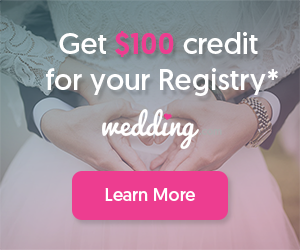 Not only that… but they’re throwing a huge virtual party via Facebook to celebrate the launch on HSN on October 7th, 2015 – complete with tons of awesome giveaways + designer guest chats! 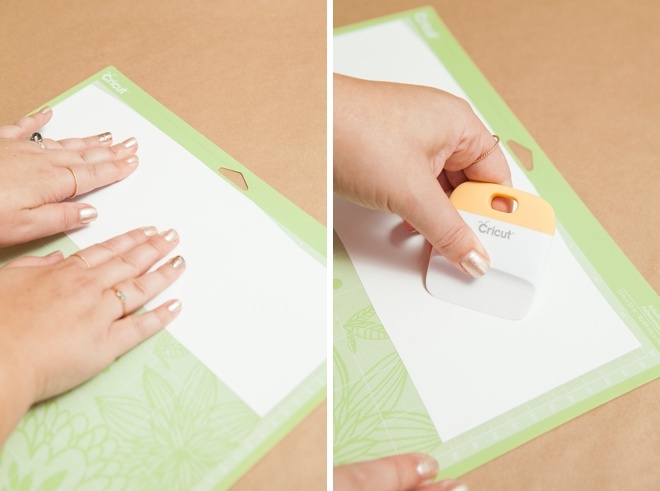 You can even enter to win a GOLD Cricut Explore Air for yourself, just by RSVP’ing! 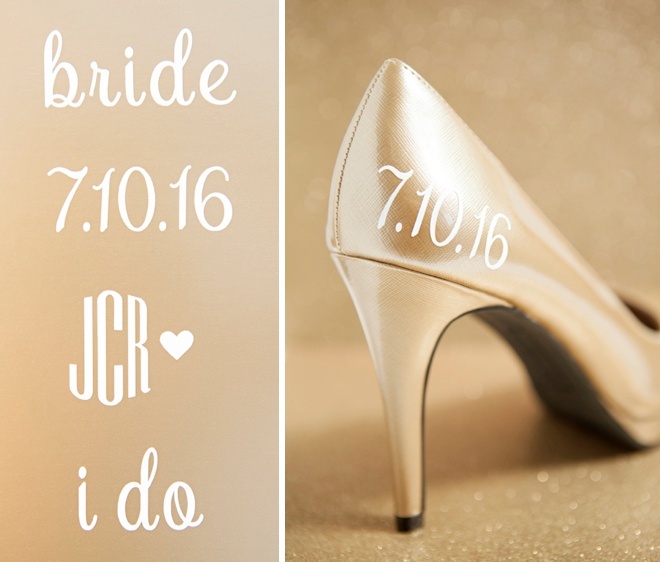 I’m going to be at the virtual bash on the 7th as one of their guest designers, chatting about these adorable wedding shoe stickers that I’m sharing today + lots more, so if you’ve ever wanted to ask me anything or you’d just like to say hi… now’s your chance! I’m personally giving away a gold goodie box during the event and possibly even a gold Cricut machine – don’t miss it! Come and join me, and let’s get our gold party on! RSVP + Enter To Win + Chat With Me: Here! 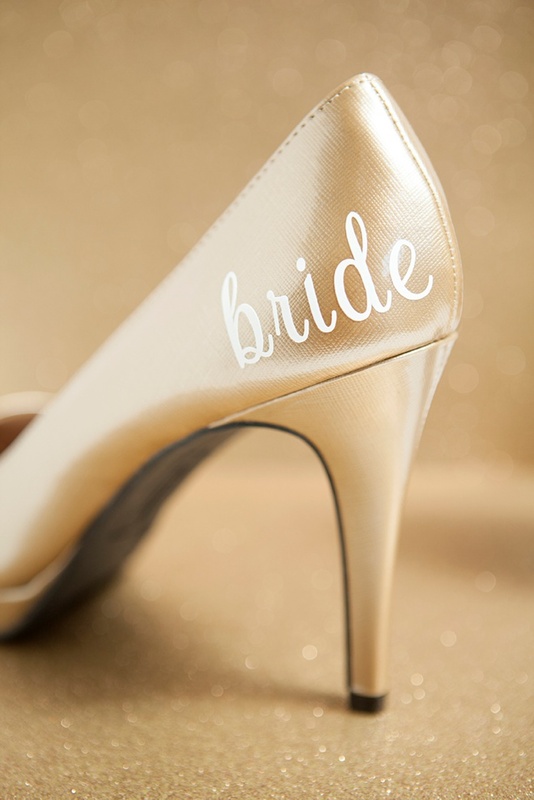 To make sure that your custom wedding sticker adheres to your shoes and doesn’t fall off, you’ll need to apply them to leather, faux leather and other smooth surfaces. Rubber soles and fabric shoe surfaces are a no-go. Bride (or appropriate name). Created using the Anna Griffin® Soiree Lettering Cartridge (grace script). Wedding Date. Created using the Anna Griffin® Soiree Lettering Cartridge (grace script). Monogram. 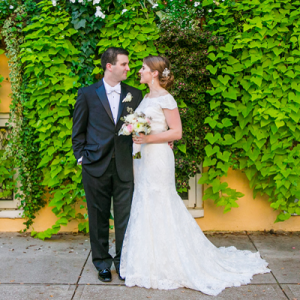 Created using the Anna Griffin® Decorative Monograms Cartridge. I Do! (small + large) Created using the Anna Griffin® Soiree Lettering Cartridge (grace script). Open a new canvas in your design space and add two separate text boxes; one that says “i” and one that says “do”. Measure the area where each sticker will be on your shoes to know how much space you have to work with – and size your letters to fit. These were for the bottom of the heels so I had a fair amount of space to work with. The steps are the same no matter the size of your custom sticker. I used the Anna Griffin® Soiree Lettering Cartridge (grace script) at 358 font point for the “i” and 275 font point for the “do”. It’s funny as they don’t look different sizes but the i is so much smaller than the d, so I adjusted accordingly. This font comes with a double layer design, which I didn’t want – so I turned it off by clicking the eye in my tool bar. I added heart image #M3775B… to replace the dot of the “i”. I didn’t need to cut two heart layers so I turned one off and made it small enough to fit as the dot of the “i”. Then I made the heart the same color as the “i do” – so that the software knows I want to cut them out of the same material. Cut a piece of vinyl large enough for your custom sticker and add it face up on a Cricut cutting mat. Smooth, making sure there are no air bubbles. Once you are happy with your design – click go and get ready to cut. For this project, it’s best to have space around your design for weeding/cutting – so I moved them apart from each other a bit on my cutting mat preview. The machine is naturally in “space saving” mode which is great for other projects, just not this one. Set your machine to cut “vinyl”, insert your mat and let the machine do it’s work! 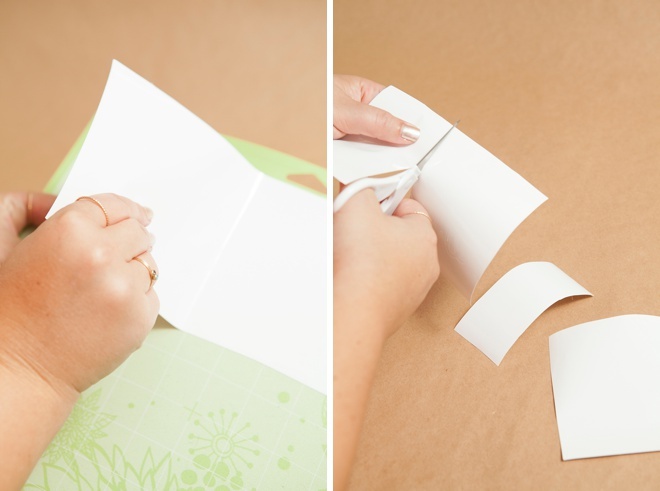 After the Cricut is done cutting, carefully remove the vinyl from the cutting mat and cut each of your designs into smaller sections. FYI: I’ve had a lot of questions and concerns from people about making their own stickers and decals – so I’m breaking it down step by step for you today. It might look like a lot – but it really does go quickly! Carefully remove ALL the vinyl material that isn’t a part of your custom sticker by using the piercing tool – this is called “weeding”. I’m sorry it’s so hard to see here… but I think you get the gist. Ps. I removed the dot of the “i” and replaced it with the little heart. 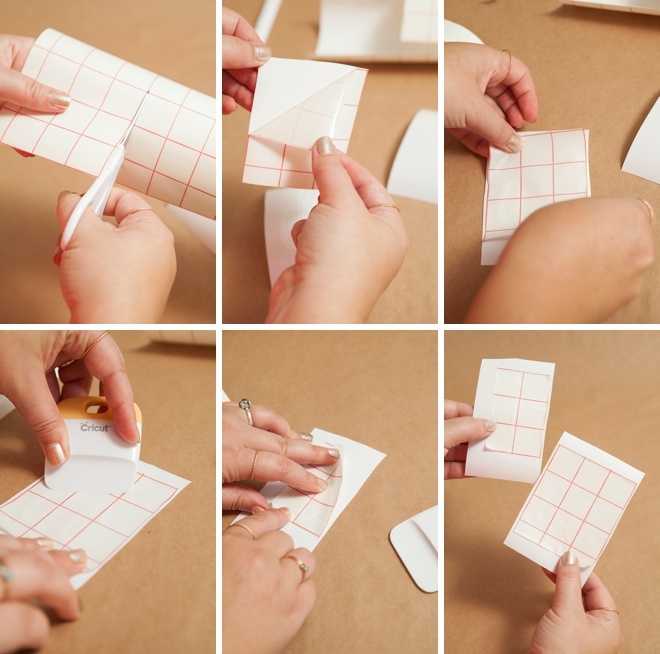 Cut a piece of transfer tape large enough to cover each sticker. Then peel the checked layer off the backing, place right on top of your sticker and smooth. This magical material makes it a breeze to apply custom stickers and decals. For small stickers that are made of only one piece, you don’t really have to use the transfer tape – but for stickers with 2+ pieces and intricate bits, you absolutely need it to keep your design intact during the transfer to it’s final surface. Now simply remove the transfer tape from your vinyl backing (your sticker should perfectly come with it) and adhere to your shoe! Smooth and carefully remove the transfer tape. 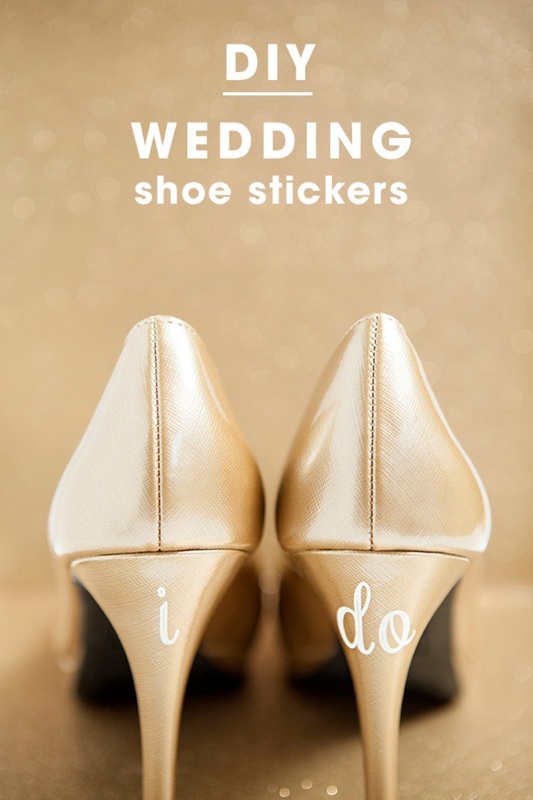 Do the second shoe, but hold the other close by to make sure your stickers line up evenly. I did the demo with the larger stickers, but the steps are the same for all shoe stickers including the others you see here and the unique designs that you’ll make! 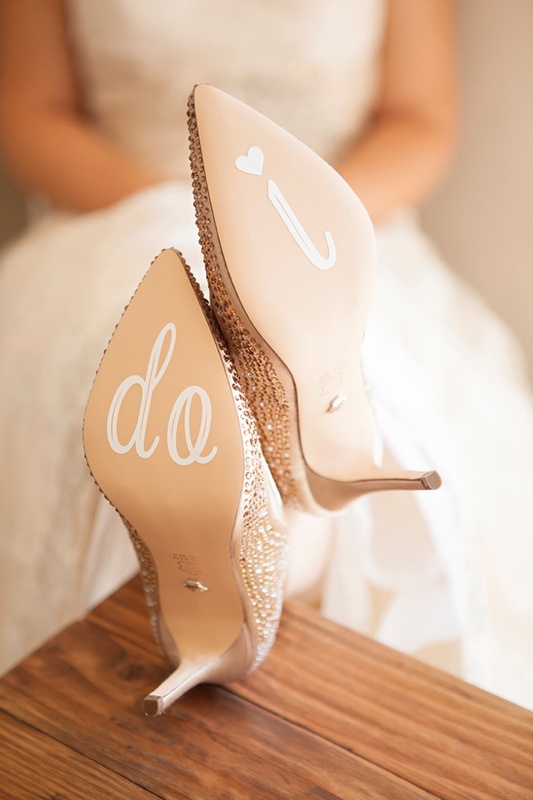 Make Monograms For Your Bridesmaids Shoes! 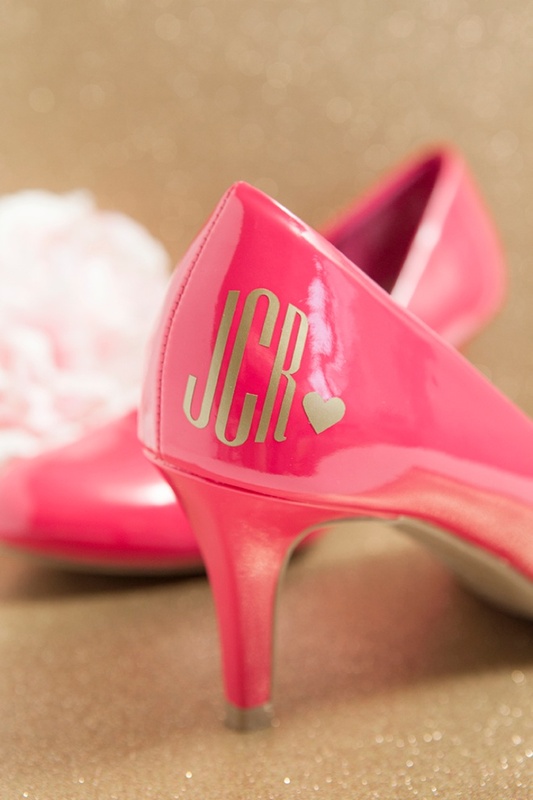 Create a special monogram sticker for each of your bridesmaids to add to their wedding shoes! 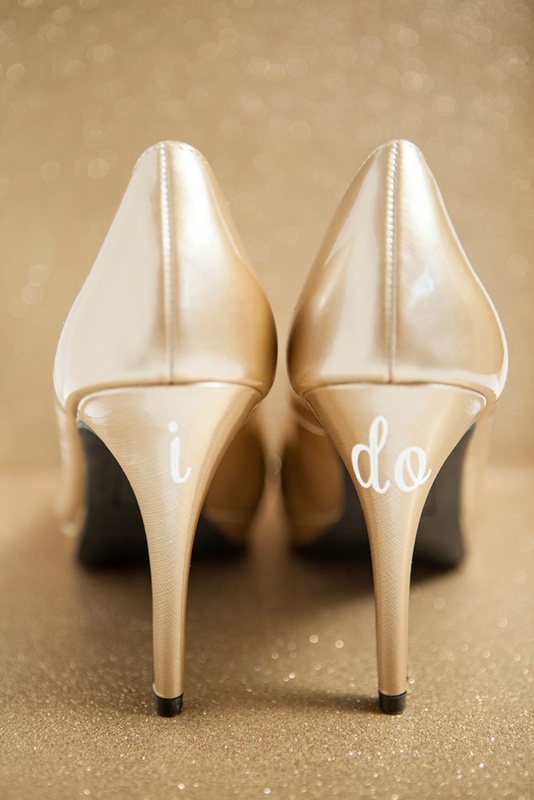 These of course would make adorable photo ops and are a great idea if your bridesmaids are wearing matching shoes. Have you heard? Cricut is releasing a GOLD Special Edition Explore Air …OMG… and they’re throwing a huge virtual party via Facebook to celebrate the launch on HSN on October 7th, 2015 – complete with tons of awesome giveaways + designer guest chats! I’ll be there so make sure to stop by!